Meeching and Testside hard at work. It's easy for me to date this image, as the car ferry seen at the ramp is Falaise, in her original black and white livery that she wore for her first season in 1964. Falaise would be taking out the 10.00 sailing having arrived a couple of hours earlier, so this is a photo taken between 8.00 and 10.00 on a summer's day in that year. In the river, Meeching is seen just picking up a laden mud barge from the bucket dredger Testside. Both would have started work at 06.00 (British Railways port, so it was the standard 6 to 2 shift plus overtime!). Here, Meeching has just dropped an empty barge alongside the dredger to be filled with mud and has picked up a full one. By the time Meeching had towed that barge out to the dumping ground and back, the previously empty barge would be full, ready for collection. And so the process would continue, all day, if the weather was fine. At the wheel of Meeching would be my Dad, Frank Gilbert, or Alex Pringle or perhaps Sally Flowers. And, if it was in the school holidays, there's a good chance that I'd have been there in the wheelhouse too. My Mum sometimes used to tell me that I lived on board during the summer! Looking at the full sized image, I can see a small tug lying at the South Hard, perhaps for some underwater work to be carried out at low tide. It's one of several ex-TID tugs owned and operated by the Newhaven-based Metrec company. Judging by the wheelhouse, this one looks like Sunnyside. At the car ferry berth at the right of the photo, the metal surround above the link span ramp hasn't yet been fully painted - it looks like lots of primer is still in evidence! That makes me think it's early summer, not long after the car ferry service started in June. The Watch House and Lifeboat House are clearly seen, as are some of the buildings of the RAF base in Huggetts Field. In Sleepers Hole, there are just the two original pontoons of Cresta Marina - the southern extension with its extra pontoons wouldn't be completed for another year or two. 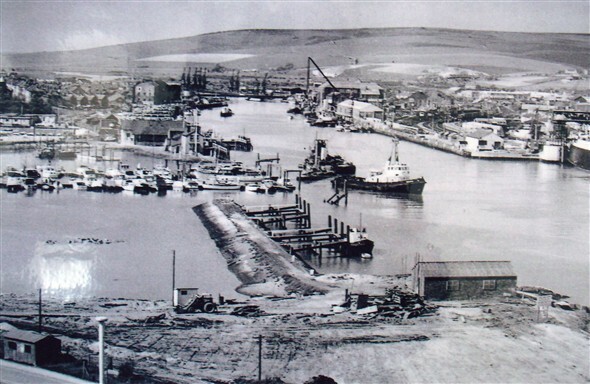 In the distance, you can see the old swing bridge, the sheerlegs up at the Marine Workshops and, on the West Quay, the Sheet Loft. The grey vessel lying at the Railway Quay is a former boom defence vessel, the Barcroft. This page was added by Andy Gilbert on 12/10/2018.